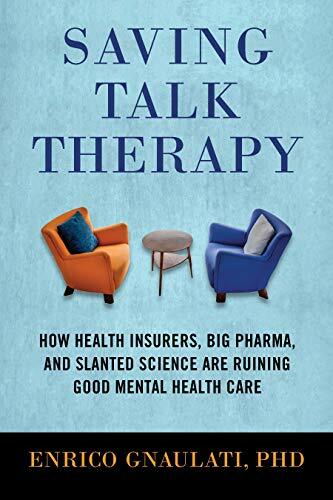 Enrico Gnaulati, PhD’s book, Saving Talk Therapy: How Health Insurers, Big Pharma, and Slanted Science are Ruining Good Mental Health Care is a hard-hitting look at the undermining of quality mental healthcare in the USA. It is a must-read for those who serve in the mental health field. People who seek mental healthcare in the USA often expect that they will sit across from a therapist who will help them dive into their deepest dreams and desires. Traditionally, this was a lengthy process with a therapist and client spending a considerable amount of time discussing and analyzing an individual’s struggles and hopes. Now, mental healthcare often comes in the form of a pill prescribed by a family practice physician or a small number of talk therapy visits focused on behavior. How did the landscape of psychotherapy change so drastically? Gnaulati gives many reasons for changes in practice and accessibility. Chief among these reasons is that most insurance companies simply won’t pay for quality, long-term mental healthcare. Though premiums are rising quickly and insurance company profits are soaring, managed care plans limit patient access to care. This was done as a cost-reducing measure for insurers. By limiting the types of care covered in a plan as well as the number of visits an individual may have in a year, insurance companies control the type of care offered. This change has done little to make mental healthcare more affordable or effective, and Gnaulati argues has had a tremendously damaging impact on psychotherapeutic practice for all but the wealthiest Americans. Pharmaceutical companies have also pushed an agenda that has damaged the quality of psychotherapeutic offerings in the USA. “Pill therapy,” the prescribing of medications to address common emotional concerns, has taken hold across the nation. Though medication has a place in psychiatry, these medications are tremendously overprescribed, often by family practice physicians with little training in psychiatry. Purveyors of competing medications work to win customers through direct-to-consumer marketing campaigns. Some of these medications have serious side effects and/or can be addictive. There are even medications that can worsen an individual’s clinical condition or amplify suicidal ideation. The limiting of talk-therapy options accompanied by pill pushing is occurring in a climate in which the vast majority of Americans would rather see a psychotherapist than take medication. However, if medication is what insurance will cover and a person can’t find or schedule with an affordable psychotherapist, the individual will generally choose an attempt at symptom relief over no service at all. Useful or not, pharma and insurers win. The restrictions put on access to care initiated by insurers and the push for medication use by Big Pharma has changed the way psychotherapists are trained in this country. Gnaulati focuses in particular on the emphasis on cognitive behavioral therapy (CBT), which is used as a quick-fix to many psychological issues, but he argues, fails to give lasting results. To support his case, Gnaulati shows how research bias favors therapies like CBT, but does so in ways that skew efficacy results. One of the strongest aspects of this book is the way that Gnaulati interweaves stories from his clinical practice throughout the work. These stories illustrate the problems in the system and show how a humanistic approach to psychotherapy addresses the problems he illuminates. He is even-handed in choosing his stories. When discussing medication for example, Gnaulati gives examples of situations in which individuals were helped by medication, had marginal results from medication, or were harmed by medication. This broad range of cases reads as fair and thorough as he makes his arguments. Gnaulati not only analyzes and makes a case for what he sees as the problems with American mental healthcare, he also offers solutions. Gnaulati writes in depth about how psychotherapists can practice to improve outcomes. He devotes the last three chapters of the book to this concern. He discusses real issues such as authenticity, sensitivity, and disclosure. In doing so, he paints a picture of a psychotherapeutic practice that is humanizing and supportive. One of the most poignant points in the book comes in a discussion about authenticity. Gnaulati describes the psychotherapist’s desire to be “clever” as a way to deal with a client’s “stuckness.” He suggests that instead of offering explanations, perhaps the responsibility of the psychotherapist is to witness to the individual’s pain. It is this witnessing of pain and willingness and ability to engage with the client on his/her journey toward better self-knowing and psychological health, that is the calling of the psychotherapist. Saving Talk Therapy is a bold invitation to psychotherapists, particularly those who teach, to change the way they practice. Mental healthcare professionals can advocate for higher quality care, better access to care, and a more humanistic approach to psychotherapy. The pursuit of happiness, as Gnaulati writes, is foundational to the American way of life. Empathy, something lacking in many contemporary encounters, is the center of good therapeutic practice. Saving Talk Therapy is an outstanding look at psychotherapeutic practice in America and should be on the desk of anyone involved in mental healthcare, whether service provider or patient.